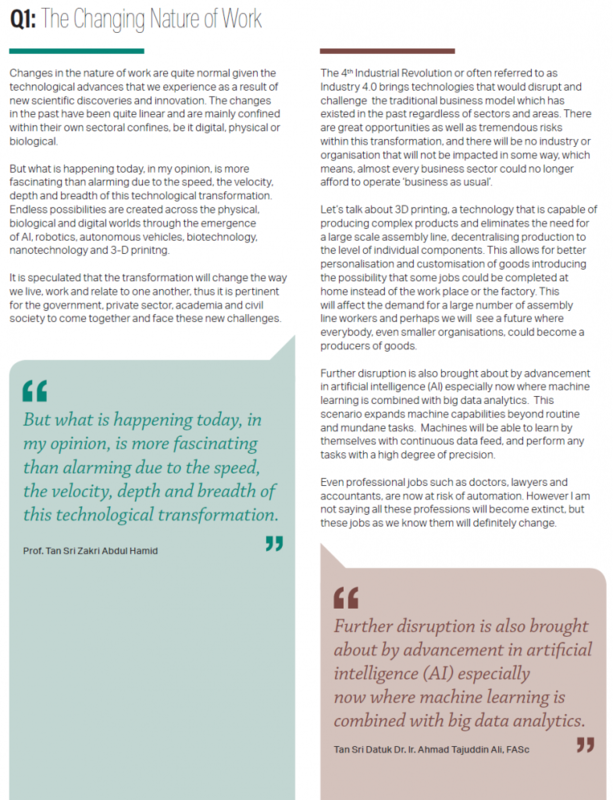 The acceleration of connectivity and cognitive technology is changing the fundamental nature of work. As AI systems, robotics, and cognitive tools grow in sophistication, almost every job is being reinvented and the nature of work is changing. As this trend gathers speed, organisations must reconsider how they design jobs, organise work, and plan for future growth. Understanding these shifts will help policy makers, business leaders, and workers move towards the future. 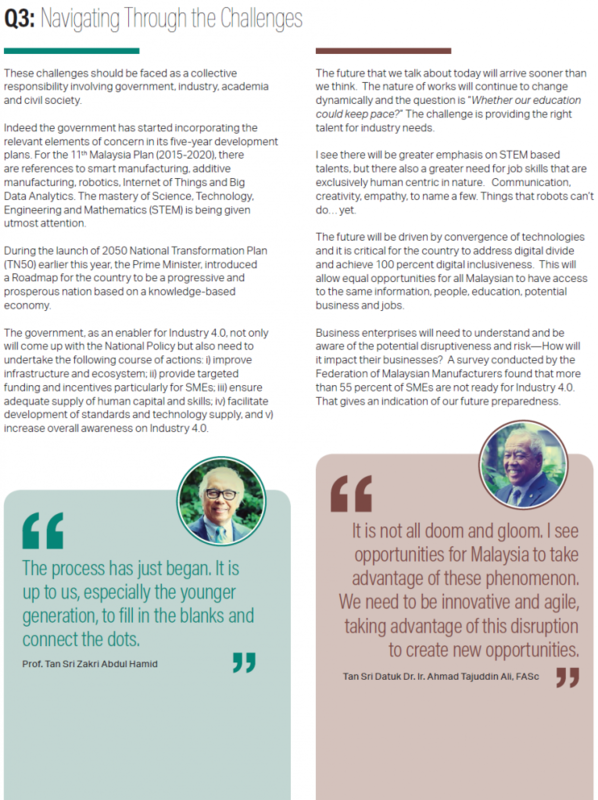 At the core of Malaysian Industry-Government Group for High Technology (MIGHT), is the spirit to foster collaborative engagement between Government and Industry in moving our nation’s high technology industry forward. It is in this spirit of cooperation that MIGHT has two leading personalities representing each group steering its course as Joint Chairs of MIGHT — Professor Tan Sri Zakri Abdul Hamid, the Science Advisor to the Prime Minister of Malaysia and Tan Sri Datuk Dr Ir. 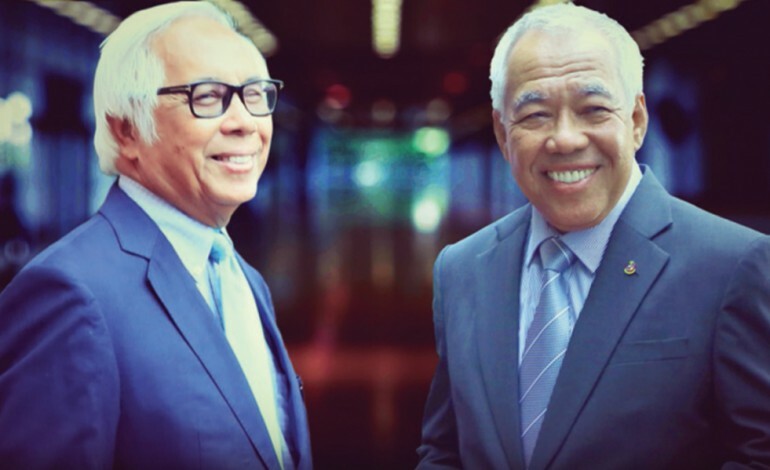 Ahmad Tajuddin Ali, FASc, an industry leader with an illustrious vitae to his name. Together, with their combined wisdom and experience, and earnest hope for a prosperous nation on all fronts, we seek to gain their insights in charting our way forward. Read the full interview and hear their thoughts on how we can navigate through the future uncertainties.